1. Heat the milk and bring it to boil. Remove the milk from heat and add vinegar. 2. 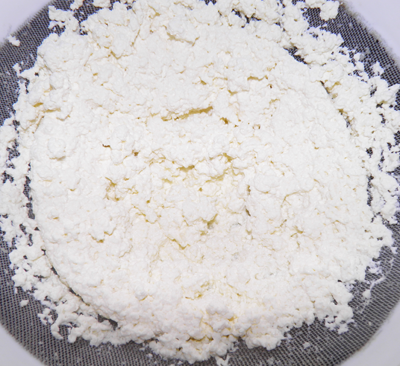 Stir gently until white curd forms and separates form whey. 3. Strain the milk, you will get the curd. The curd is called chhana/chenna. Wash the hot curd properly under cold running water. It is easy to put strainer under running tap. We get home made cheese. We need this cheese to make basically most of the Bangladeshi and Indian desserts. Hi, it’s me again. I was reading your channa recipe. I have some question about this process. How do we drain water from channa.Should I just leave it for few hours to drain the water or squeeze the water from channa. I normally make the channa little bit different way then you. But it’s almost same. I normally hang the channa to drip the water. Please let me know what do you think to drain the water from channa. Does it make any difference adding more vinegar onto milk? I used to use 3 table spoon vinegar with 3 table spoon water and i don’t wash channa with cold running water. I also used put vinegar while milk was boiling and keep the milk on the stove until milk becomes curd. Does it effect channa’s quality? Your comments will be much appreciated. I like your detail. Love that you read properly. Washing chhana is essential otherwise sourness of vinegar will be there. if you cook to much , it will make dry crumbly channa. Hanging channa is the most common to drain the water. But strain is easier option to me. some of us like to mix vinegar with water and then add it. I never mix with water and never had problem. Actually all of us have different style for cooking. we should follow that style which one is easier for us. Thanks. How much chhana should we get from 1 liter of milk? Asking because I am using Skimmed powder milk as I have quite a lot of them in stock. hi i love to make sweets and do my little sweet sale catering and followed ur lots of recipe several times. today i read that we should use fat free milk to make channa for making rasgulle and same type of sweet.can u help me pls? if fat free what in AU what type of milk we should use?low fat milk?waiting for ur reply. I always make rosogolla with full fat milk. Never tried with low fat one. My rosogolla always comes perfect.